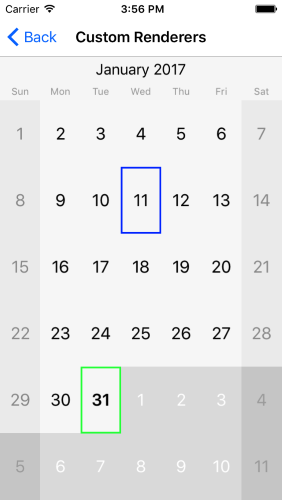 Sometimes, you might find that certain feature is available in the native control on a given platform, but is not exposed in Xamarin Forms or you might want to customize the calendar look for each platform. This is when you would need to create a custom renderer. This will allow you to access the native control and configure it as per your needs. The native Calendar control documentation can be found here.